When Steve and Shelli Starrett went on their first date as high school sweethearts, it was to a school “barn warming” dance in their high school gym in Mansfield, Missouri. Shelli, 16, was a sophomore. She drove the car. Steve, 15, was a freshman. He didn't yet have his license. And her two younger sisters sat in the back seat. Remembering that first date now, after 31 years of marriage, the two of them laugh easily together in Steve’s new office as the new dean of engineering at LeTourneau University. Steve, an internationally renowned scholar in engineering ethics, began his new role in July 2017, following a national search. He said leading the premier engineering program in Christian higher education is an honor. Steve and Shelli are both accomplished engineering professors. Both have taught during the past two decades at Kansas State University, where Steve most recently served as director of K-State’s university-wide Honor and Integrity System. He also was undergraduate program director and associate professor of civil engineering. Shelli, a former NSF CAREER grant recipient, was also an associate professor of engineering at K-State. She will begin teaching engineering at LETU in the spring semester. Steve and Shelli both earned their Ph.D. degrees in 1994 from Iowa State University—his in Civil and Construction Engineering (Environmental Engineering) and hers in Electrical Power Engineering. At commencement, they walked together across the stage. Steve’s master’s degree is in civil and construction engineering (water resources) from Iowa State. His interest in water resources stems from his love for the lakes of his home state of Missouri. His undergraduate degree in civil engineering is from Missouri University of Science and Technology (the new name for University of Missouri-Rolla). Shelli’s master’s degree in electrical power engineering and her bachelor’s degree in electrical engineering with an emphasis in power engineering are both from University of Missouri-Rolla. In his 22 years at K-State, Steve has taught various water resources engineering and engineering ethics courses. He serves as president of the 20,000-member Environmental and Water Resources Institute, one of the largest technical institutes of the American Society of Civil Engineers. He is a fellow of both the ASCE and the EWRI. He is a diplomate of the American Academy of Water Resources Engineers and a member of the Missouri University of Science and Technology Academy of Civil Engineers. Steve also has experience as an expert witness in numerous legal cases related to water resources issues including erosion control, flooding, hydraulics, groundwater and surface water hydrology and siltation. He is a licensed professional engineer in the states of Arkansas, Kansas, Missouri and Oklahoma. Steve says his scholarly interest in engineering ethics began after studying as an undergraduate student the July 17, 1981, Hyatt Regency Disaster in Kansas City, Missouri. The structural integrity of the connection holding up two suspended walkways collapsed more than 60 tons of steel, concrete and glass into a crowded ballroom of nearly 1,600 people, killing 114 and injuring 216. It was the deadliest structural collapse in U.S. history, until the collapse of the World Trade Center in 2001. Steve was one of the first engineering professors in the country to offer online graduate courses for working professionals pursuing online graduate degrees. “I developed some online ethics courses for graduate students, with more than 1,000 students taking those courses,” he said. He has been recognized by the National Academy of Engineering for providing an exemplar course in engineering ethics. He has participated in research projects funded by the National Science Foundation focused on graduate engineering and science programs and has also taught engineering ethics workshops internationally through ASCE events in Ecuador, Canada and Sri Lanka. Steve recently was named the lone recipient of the Professional Practice in Ethics Leadership Award by the American Society of Civil Engineers—known widely as the most prestigious award in engineering ethics. He will receive the award at a gala in October. Of his move to Longview, Steve said he feels God has prepared him for his new role as LETU’S engineering dean. "Looking back, I definitely see God's hand preparing me for LeTourneau University with several of my experiences over the last 20 years," he said. "My interest in engineering ethics fits so well with the culture of LeTourneau, my international professional society leadership experiences, and my central administration role at Kansas State University." 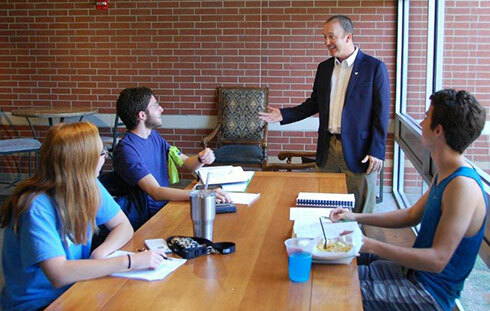 Each of these experiences played a critical part in my preparations to become the Dean of Engineering and Engineering Technology at LeTourneau University." He and Shelli shepherd a new life group, having students over for dinner to their home where they play bluegrass and gospel music for fun. Steve plays mandolin, Shelli plays upright bass. The Starretts understand that building new relationships will quickly make Longview feel more like home. Shelli describes the move to East Texas as joyful, although leaving the beloved church in Kansas they had attended for 23 years was bittersweet. “Our church was our family,” Steve said. He, Shelli, and their 13-year-old son, Luke, a high school freshman, have already begun looking for their new church home. The Starretts have two adult children still living in the Kansas City area. In Kansas, Shelli home-schooled Luke and enjoyed providing hands-on engineering instruction and workshops for homeschooling groups. Their move to Longview, she said, is like a new adventure. Prepare for your future in Civil Engineering! With America's aging infrastructure and countries across the globe in need of safe transportation, innovative structures, and access to clean water, civil engineering is a bridge to the future.